Former Secretary of State Rex Tillerson had a stark warning Wednesday about a "crisis of ethics and integrity" and the dangers of "alternative realities" and leaders who "seek to conceal the truth." Add Rex Tillerson as an interest to stay up to date on the latest Rex Tillerson news, video, and analysis from ABC News. In his first major speech since he was fired by President Donald Trump in March, Tillerson gave the commencement address at the Virginia Military Institute in Lexington, Va., and although he never mentioned Trump specifically, the pointed remarks appeared to be shots at his former boss. "If our leaders seek to conceal the truth or we as people become accepting of alternative realities that are no longer grounded in facts, then we as American citizens are on a pathway to relinquishing our freedom," he told the graduates. At the center of "a growing crisis of ethics and integrity," he said, was that kind of assault on the truth, the "central tenet of a free society." "When we as people, a free people, go wobbly on the truth – even on what may seem the most trivial of matters – we go wobbly on America," Tillerson added. "If we do not as Americans confront the crisis of ethics and integrity in our society and among our leaders in both public and private sector – and regrettably at times even the nonprofit sector – then American democracy as we know it is entering its twilight years." Secretary of State Rex Tillerson and President Donald Trump speaks to the press, Aug. 11, 2017, at Trump National Golf Club in Bedminster, N.J. In the face of that, it is every American's responsibility to each other "to preserve and protect our freedom by recognizing what truth is and is not, what a fact is and is not, and begin by holding ourselves accountable to truthfulness and demand our pursuit of America's future be fact-based," he said. The former ExxonMobil CEO had a rocky relationship with the president, with many of their policy disagreements out in the open and Trump cutting him down on a handful of occasions with open rebukes. It was reported that he called the president a "moron," something he never denied, saying he would not deal with "petty nonsense." But he was also criticized for mismanaging the State Department, instituting a hiring freeze that was seen as destructive and unnecessary, leaving top positions vacant or filled by officials in acting roles, and concentrating power within a small inner circle that alienated many employees. He was also known for his distrust of the media, initially barring journalists from traveling with him and giving few interviews. Tillerson joked that the role was not his favorite, saying that he had his dream job in 1992 at Exxon as a division manager over Texas, Oklahoma, Kansas, and Colorado: "All I ever wanted to do, it was the best job I ever had. It's all been downhill since," he said to laughs. He also laid out three "beatitudes" from an old Boy Scout leader that could be taken as self-descriptions. "Blessed is the man who can see you make a fool of yourself and doesn't think you've done a permanent job," he said to laughs and applause. "Blessed is the man who does not try to blame all of his failures on someone else. And blessed is the man that can say that the boy he was would be proud of the man he is." Many of his lines, however, were not new. A proud Eagle Scout and former president of the Boy Scouts of America, he spoke at length about the importance of integrity to building trust and cooperation and solving problems, as he had several times as secretary, including in his farewell address in the department's lobby. "We do not have to look far to find examples of the cost to individuals and to society when integrity is sacrificed for immediate gain or personal achievement. Such damage strikes at the very heart of a free society, it undermines the public trust in institutions and the overwhelming number of individuals, organizations who do live and compete by the rules every day," he said. His message to graduates was to join organizations or work at companies that value integrity, and "Look for employers who set high standards for personal conduct and who reward ethical leadership." The former top U.S. diplomat also dipped into foreign policy, taking some shots at President Trump's trade policy and criticism of U.S. allies. 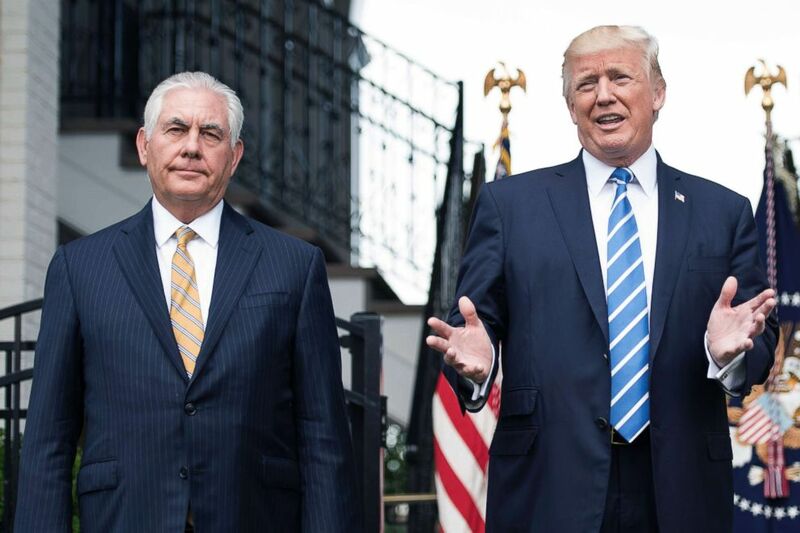 While Trump pursued protectionist trade policies and welcomed trade wars as "good, and easy to win," the global businessman in Tillerson fought against them, urging the president to reconsider steel and aluminum tariffs in one of the last battles that he lost while secretary. "Here at home, [global economic] changes have led to anxiety and fear about the growth in foreign markets and about the global movement of jobs," he said Wednesday. "We must acknowledge, however, that every nation has a right to aspire to a better quality of life and that free trade and economic growth are the means by which opportunity is created for all people."